Join the excitement in our live casino! T&Cs apply. Claim 50% of your deposit back, up to £50. Min deposit £20. Credited when account balance is 0. New customers only. 18+. BeGambleAware.org. One of the best elements of the online casino experience is the online dealer. In the same way that a bricks and mortar casino has a croupier handling your game, live online casinos have a real croupier who deals the game to you. 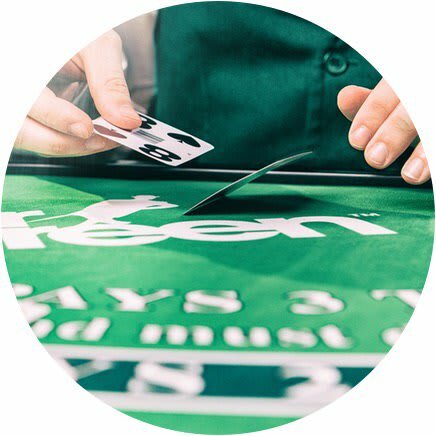 At Mr Green, the live casino games are played through the use of video and audio communication systems and as a player, this allows you to see the dealer as they deal the entire game. 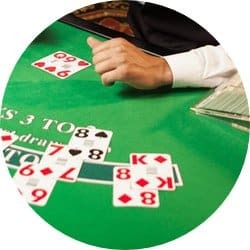 You will see them shuffle the cards and deal them out, while you will also be able to hear them manage the game with commentary, just like in a real bricks and mortar casino. You can even talk to the dealer during the game. Mr Green uses a chat function for the dealer and player to interact as the game progresses and since the feeds are live, the player can ask questions at any time. For example, you can tell the dealer whether you want to stand or hit while playing blackjack. All dealers are fully trained, friendly and professional, giving helpful advice whenever asked. Play against real dealers in the Mr Green Live Casino. It is easy to start playing at Mr Green. Firstly, you need to create an account. All players must be over the age of 18 and you may be asked to provide ID. Once you login to your account, you will choose which game you want to play. Simply click on your chosen game and begin! Players will all be greeted by the live dealer and the game will start once all players are seated at the virtual table. All online casino games at Mr Green play under the same rules as they would at a bricks and mortar casino. The big difference when playing the games online is that the dealer is the person taking the bets, dealing the cards and starting/ending the games. This gives a much better experience than using online games software because the dealer is a real person who can help you with any questions or problems you might have during the game. Live casino games also enable 100% transparency and the live video stream is never interrupted. This means that players can see the dealer’s hand throughout the entire game, view the deck of cards and watch the roulette wheel. Players can see everything that matters to them. Mr Green’s innovative Live Beyond Live is a truly unique virtual casino experience that we believe will shape the future of live casino gaming. It is a completely new way of playing traditional casino table games online. You enter the virtual casino floor of Mr Green’s Los Angeles penthouse, where there are two roulette tables and two blackjack tables that you can play at. There are people moving around in the room and you will see other players betting at the other tables in the background in real time through an embedded live stream. Without a doubt, the main live dealer casino games are roulette and blackjack (which you can play on your mobile in our innovative Live Beyond Live environment), and baccarat. At Mr Green, players can also find live poker, Texas Hold’em and Sic Bo. Live Baccarat is considered to be a high rollers game and one of the oldest live dealer online casino games offered at online casinos. All the same baccarat rules apply with the exception that the live dealer is the one who takes and places the bets. 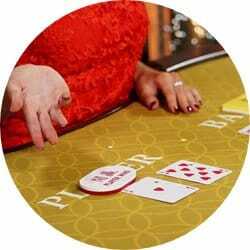 The most popular baccarat game is Punto Banco. 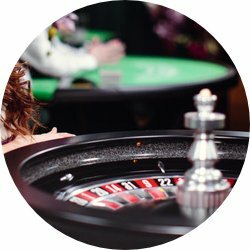 Live Roulette is a very popular choice for live casino players and at Mr Green you will find a friendly dealer who you can see spinning the wheel and hear calling the winning numbers. Bets are placed within a set amount of time before the dealer begins the game by spinning the wheel. Live Blackjack is a game that is played directly between the player and the dealer, just like in a physical casino. Play Roulette, Blackjack and Baccarat in the Mr Green Live Casino. The only way to know which casino game at Mr Green is right for you is to try them all and see which game you enjoy most. Online casinos have risen in popularity as extensions of bricks and mortar casinos and the reason for that is clear – come see for yourself the draw of bringing a live casino gaming experience into your living room! Playing live casino games at Mr Green has never been easier; all you need is a screen and a microphone. You don’t even need to have a webcam! An internet connection and your web browser of choice will support the live gaming experience. If you prefer to play on your smartphone, the games at Mr Green are available on any device. We take the safety of our customers’ details very seriously. You can be sure that your online casino gaming experience is safe and that your winnings will be placed in your account to be withdrawn whenever you like – or used to play more games. All games are played over secure lines which cannot be accessed by third parties. The best way to maximize your winnings is to thoroughly understand the game you are playing. Read up on the rules of the game so you will not be surprised by events while you are playing. Understanding the betting procedure and the odds are crucial elements of playing and winning at casino games and making small bets is always the safest option. Playing live casino games at Mr Green provides players with an interactive gaming experience that recreates the excitement of being at a real casino. You can play on your PC or mobile device from wherever you are with a choice of exciting games to suit all players. Players can enjoy a fully immersive and truly amazing casino experience with our friendly, live dealers. Come and see for yourself! Enjoy an interactive live casino experience at Mr Green. Play live casino games now!